Strasbourg (German: Straßburg) is the capital and largest city of the Alsace region of France, close to the border with Germany. 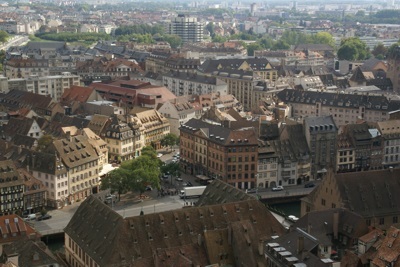 As of 2004, Strasbourg had an estimated population of 272,800. Strasbourg is the capital and largest city of the Alsace region of France, close to the border with Germany. 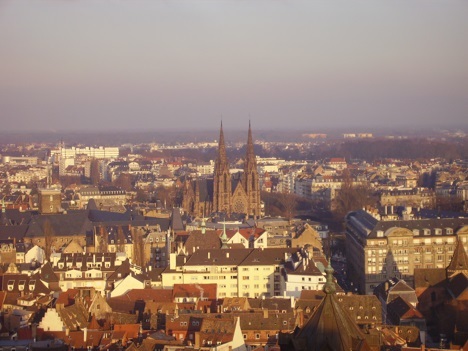 As of 2004, Strasbourg had an estimated population of 272,800. Strasbourg's history dates back to at least Roman times. The Romans established a military outpost at the city's current location in 12 BCE (or possibly earlier) and called it Argentoratum. During the fall of the Roman Empire, the city was occupied by the Alemanni, Huns, and then Franks. The Oaths of Strasbourg (842) marked the division of the Frankish Carolingan Empire between Charles the Bald, ruler of West Francia, and Louis the German, ruler of East Francia. This is event is considered by many to be the birth of both France and Germany. Strasbourg came under the control of the Holy Roman Empire in 923. Construction of Strasbourg Cathedral (French: Cathédrale Notre-Dame de Strasbourg; German: Liebfrauenmünster zu Straßburg) began in 1015, although it was only completed in 1439. As a result of erosion of the Great Pyramid of Giza in Egypt, storm damage to Lincoln Cathedral in England, and fire damage to St. Mary's Church in Stralsund, northern Germany, it became the tallest building in the world in 1647, a title it held until over taken by the construction of the Church of St. Nicholas (German: St.-Nikolai-Kirche) in Hamburg, Germany. In the mid 15th century, Johannes Gutenberg created the first European moveable type press in Strasbourg. In 1518, Strasbourg was struck by the "Dancing Plague of 1518". Numerous people took to dancing continuous without rest, and some died from heart attack, stroke, or exhaustion. During the Thirty Years' War (1618 to 1648), the Free City of Strasbourg remained neutral. However, the city subsequently attracted the attention of Louis XIV of France, whose forces occupied the city in 1681. During the Franco-Prussian War (1870 to 1871), the city was beseiged and bombarded by the Prussians, and with the war's conclusion annexed by the German Empire in 1871. With the conclusion of World War I, the city was returned to France in 1919. During World War II, and with the German occupation of France, Strasbourg was again annexed to Germany during the period from 1940 to 1944. After World War II, Strasbourg was chosen as the host city of many European institutions, starting with the Council of Europe in 1949. The University of Strasbourg is currently the largest university in France. The Strasbourg Grand Mosque (French: La Grande Mosquée de Strasbourg) is the largest Islamic place of worship in France.